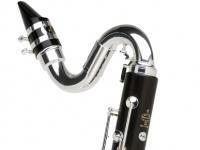 Buffet Group is one of the leading manufacturers of wind instruments in the world. If you purchase a new instrument through iNNOLEDY at the Buffet Crampon New York Showroom or Buffet USA in Jacksonville, Florida we'll set it up at no charge. Prestige model is perfectly adapted to the experienced amateur and the ensemble musician. Its tone is rich, homogenous and focused. This new TOSCA bass clarinet, conceived for the symphonic orchestras, broadens the spectrum of sound already appreciated in the existing B-flat and A models launched in 2004 the E-flat model in 2010. Its well-focused sound and luminous tone, assisted by a unique new register key system, allows the most demanding musician the ability to play the instrument’s entire repertoire with an exceptional freedom and confidence. Its intuitive, soundless TOSCA mechanism liberates the artist from the usual constraints imposed by the key action on the lower joint and the movements of the plateau keys of the instrument. Its price positioning will make this bass clarinet the best performing offer on the global market. The Tosca range is now completed with this unique brand new bass clarinet. The Buffet Crampon 1180 student bass clarinet was entirely redesigned to offer young students and amateur players an instrument providing thrilling sensations in the lowest notes which are the foundations of harmony. The 1180 is sure to suit every musical style. This clarinet facilitates the jump between intervals thanks to its new and reconceptualized simplified register key system. Its wide, homogeneous sound palette and extremely fluid legato allow the musician to experiment with every acoustic or technical idea imaginable. As the only student bass clarinet made from selected and treated grenadilla wood from Mozambique, delivered in a compact, lightweight case, the new Buffet Crampon 1180 stands out from all others thanks to the quality of its manufacture, its remarkable intonation, timbre and overall comfort. It sets itself as the global standard for student bass clarinets.